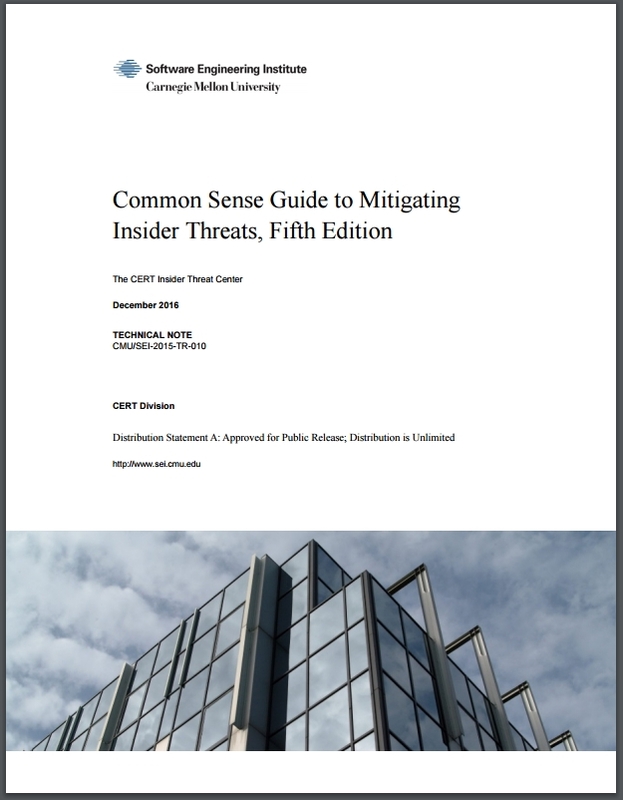 The fifth edition of the Common Sense Guide to Mitigating Insider Threats was published at the end of 2016 by the CERT Insider Threat Center. As we've come to expect from CMU/SEI & CERT), it's an impressive, well-written piece of work. Know and protect your critical assets. Consider threats from insiders and business partners in enterprise-wide risk assessments. Structure management and tasks to minimize unintentional insider stress and mistakes. Incorporate malicious and unintentional insider threat awareness into periodic security training for all employees. Deploy solutions for monitoring employee actions and correlating information from multiple data sources. Establish a baseline of normal behavior for both networks and employees. The guide expands substantially on each of those, explaining the challenges, describing case studies and offering quick wins for many of them. Pre-hiring background checks, for instance, aren't mentioned in the list above but feature several times in the guide. "Without broad understanding and buy-in from the organization, technical or managerial controls will be short lived. Periodic security training that includes malicious and unintentional insider threat awareness supports a stable culture of security in the organization." 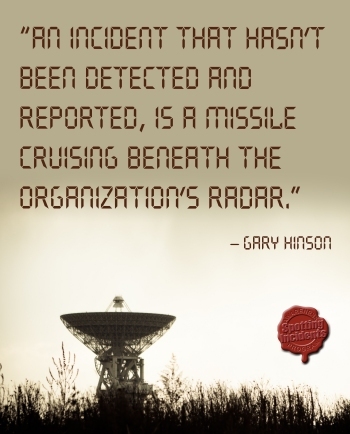 lack of attention to detail"
I'm intrigued by the concept of 'unintentional' insider threats. had no malicious intent associated with his or her action (or inaction) that caused harm or substantially increased the probability of future serious harm to the confidentiality, integrity, or availability of the organization’s information or information systems." Seems to me that covers almost everyone since we humans all experience the odd errors and accidents, but I guess it's a matter of degree: most of us catch our typoos etc. in time, without precipitating global meltdowns. The advice includes "Training programs should create a security culture appropriate for the organization and include all personnel" - OK so far on both points. "The training program should be offered at least once a year" is not so good if it is taken to mean a single annual event or session is sufficient, but I'm relieved that it goes on to mention 'refresher training'. Develop and implement an enterprise-wide training program that discusses various topics related to insider threat. The training program must have the support of senior management to be effective. Management must be seen participating in the course and must not be exempt from it, which other employees could see as a lack of support and an unequal enforcement of policies. Train all new employees and contractors in security awareness, including insider threat, before giving them access to any computer system. Make sure to include training for employees who may not need to access computer systems daily, such as janitorial and maintenance staff. These users may require a special training program that covers security scenarios they may encounter, such as social engineering, active shooter, and sensitive documents left out in the open. Train employees continuously. However, training does not always need to be classroom instruction. Posters, newsletters, alert emails, and brown-bag lunch programs are all effective training methods. Your organization should consider implementing one or more of these programs to increase security awareness. Establish an anonymous or confidential mechanism for reporting security incidents. Encourage employees to report security issues and consider incentives to reporting by rewarding those who do. The information security team can conduct periodic inspections by walking through areas of your organization, including workspaces, and identifying security concerns. Your organization should bring security issues to the employee’s attention in a calm, nonthreatening manner and in private. Employees spotted doing something good for security, like stopping a person without a badge, should be rewarded. Even a certificate or other item of minimal value goes a long way to improving employee morale and increasing security awareness. Where possible, these rewards should be presented before a group of the employee’s peers. This type of program does not have to be administered by the security team but could be delegated to the employee’s peer team members or first-level management." The quotes above are just part of the 6 pages on that one practice area, a small fraction of the guide's 175 pages - well worth the trouble to read if your organization has humans on the payroll, or depends on third party personnel for that matter - those nice people who do their level best to keep the lights on whatever the weather, for instance. PS If anyone from CERT reads this blog, please stop referring to awareness and training as if they are the same thing. They aren't. See NIST SP800-50 and SP800-16 ... or ask me!